CCFG’s primary role is to promote the transformation of even-aged plantations to structurally, visually and biologically diverse woodlands. We also aim to enhance the production of high quality timber according to the principles of continuous cover management. We are a technical and professional organisation dedicated to developing skills and disseminating knowledge. 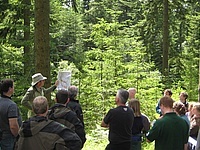 In addition, we contribute to policy formulation and wider debates about sustainable forestry in Britain. CCFG is a member of Pro Silva, a federation of forestry organisations committed to advancing close to nature silvicultural systems. Throughout the year CCFG runs a variety of field meetings, workshops, and an annual conference. Field meetings are open to both members and non-members, and students who are interested in managing woodlands sustainably are strongly encouraged to attend (at no charge). Members receive email bulletins to keep them up to date with events and booking details. CCFG is a friendly, dynamic, member-driven group with an interest in silviculture and sustainable forestry. We welcome new members who share our values and who would like to apply new techniques in the management of forests. CCFG offers an exciting range of member benefits.